The works of actor Dennis Hopper are currently on display at the State Hermitage Museum in St Petersburg, Russia. The exhibition includes works that were chosen by the artist himself, including black and white photographs from the 1960s, color photos of the city, assemblages, excerpts from films and large-format billboards. The subjects of Hopper’s photographs include well known personalities Jasper Jones, Andy Warhol, Roy Lichtenstein, Robert Rauschenberg, Paul Newman, David Hockney and Irving Bloom. 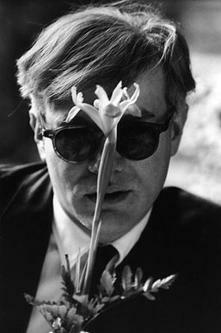 The image shown here is "Andy Warhol (with Flower)" by Dennis Hopper. The exhibition opened June 21, 2007 and will run through August 25, 2007. See the Pop Life Art home page for links to the work of more than 100 celebrities that create fine art paintings, drawings, and photographs.